windbreaks & deckchairs-branded products, promotional tools. Whether you are simply going to the beach or creating a stand at a festival or event, you can be sure that your branded promotional windbreak or deckchair from our sister company South Westerly will look the business. Our branded windbreaks and deckchairs are a must-have innovative, eye-catching and creative way to advertise. With the perfect amount of space to boldly present your logo, message, event or campaign. We can print your logo or create a bespoke design on large, eye-catching and beautifully put together windbreaks – we even offer matching deckchairs too! At South Westerly we are proud to offer you the largest range of canvas windbreaks and traditional deckchairs on the market. 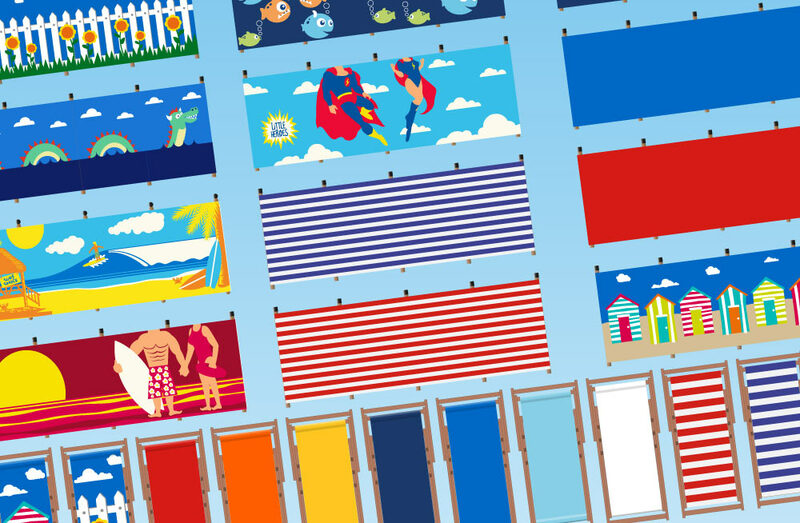 Choose from our range of classic nautical striped windbreaks and deckchairs or for that extra bit of fun choose from our range of playful windbreaks and deckchairs designs that are fun for all the family young and old. Contact our sister company South Westerly Windbreaks and see what we can provide for your business! A Little Bit of Planning will go a long way with #EarlyBirdDiscounts!